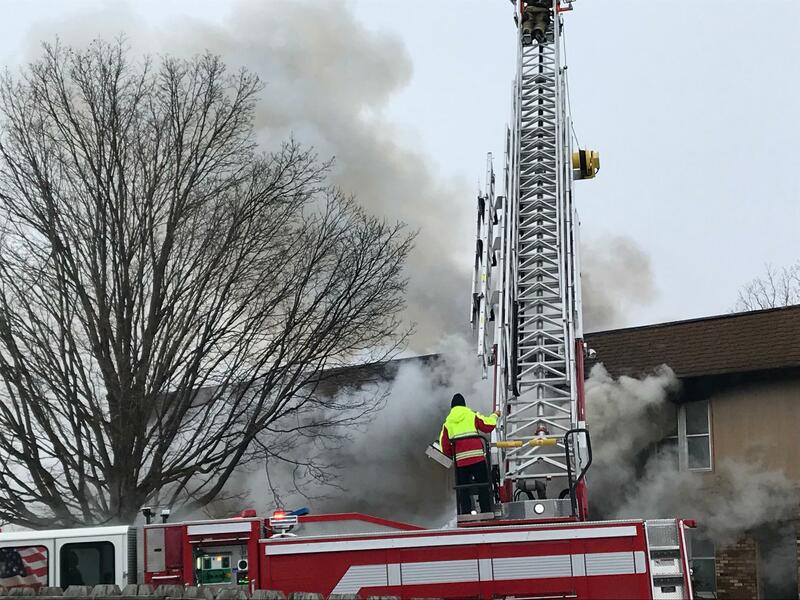 A fire destroyed an apartment building on Feb. 10. The building had 226 code violations pending. “That in my mind is the essence of negligence," Renner said on GLT's Sound Ideas, referring to the scope of the alleged violations. A firefighter suffered minor injuries and 29 people were left homeless in the Feb. 10 fire in the 1100 block of Gettysburg Drive on the city’s east side. The cause of the fire remains under investigation. The mayor said the city had set a hearing on Feb. 28 for the building’s co-owner, Wayne Pelhank, to answer the violations in the city's administrative court. He said the city filed a separate lawsuit against the owner in the McLean County Circuit Court. Usually the city files lawsuits against landlords in circuit court only after they fail to address violations through the administrative court. "That in my mind is the essence of negligence." Renner said the administrative court process for housing code violations was established about three years ago to give the city greater flexibility in pressuring landlords to make repairs and address code violations. He said city officials felt cases moved too slowly through the circuit court. The city first cited the building in September, according to city records. Bloomington filed a separate demolition request on the property in December, which alleged the building was structurally unsound, had a leaky roof, and water-logged ceilings, walls and carpeting. The September inspection found 262 violations at the apartment building. The owners were given to Nov. 28 to make the repairs, and then given a further extension. In a Jan. 30 re-inspection, the city found 226 violations, including inoperative smoke detectors, missing doors, windows that would not open, improperly installed doorknobs, water damage and cockroaches, the records indicated. It was unclear Tuesday why the owners were given an extension to address the violations and why the administrative process had taken five months. Bob Mahrt, the city’s interim director of community development, whose office oversees the housing inspections department, referred questions about the case to Angela Fyans-Jimenez, the city attorney who oversees housing cases in the administrative court. Fyans-Jimenez said the city had moved to seek a demolition order on the property as soon as inspectors found that violations cited in September not been addressed, and that there were also new code violations. She said a demolition cannot take place without a court order. The city was waiting for a hearing on the demolition order in circuit court when the fire occurred. The inspections department, she said, was continuously adding violations against the owner despite complaints by the landlord and his attorney that the landlord was being singled out by the city. Fyans-Jimenez said residents were allowed to continue living in the building even though the city wanted it demolished because city inspectors did not believe the building was "an occupancy-prohibitive structure at that time." She said the city "followed due process." Pelhank owns several rental properties in the city, Fyans-Jimenez said, including single-family homes, and is frequently cited for violations on his properties. He is currently under a payment plan to settle fines the city has placed against his properties. Fyans-Jimenez said she could not recall the total amount of fines against Pelhank. She said Pelhank and his attorney have tried to convince the city to dismiss the case against Pelhank over the Gettysburg property since it has burned and is uninhabitable. She said the city refused to dismiss the case. Contacted by GLT, Polhank's attorney, Eitan Weltman, declined to comment. Carey Snedden, Bloomington's chief housing inspector, did not return a phone call for comment. In an investigative series last fall, GLT reported that Bloomington has only two city inspectors to monitor code violations at some 10,000 units. The report also detailed how cases sometimes can take months to move through the administrative court. City officials have said their goal is to win compliance from landlords who violate the code, rather than punish them.